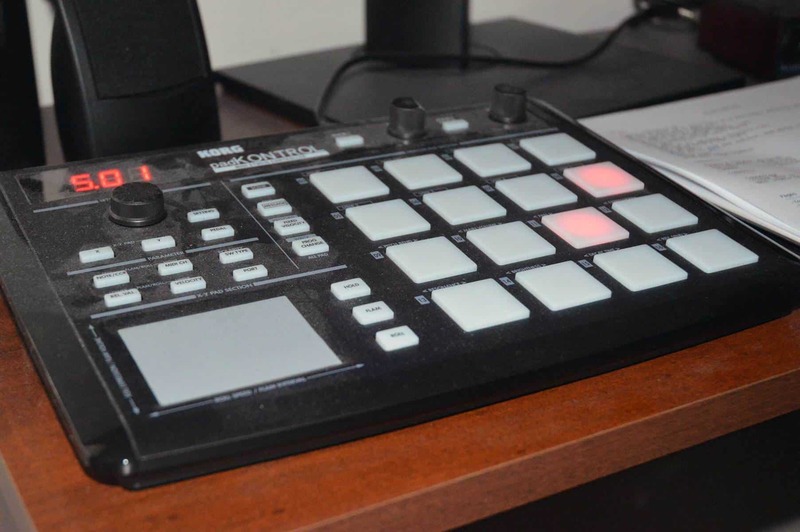 HomeMIDI ControllersCheap midi keyboard drum pad | TWO GREAT OPTIONS! Where do I even begin. This little beast of a machine held up for me from 2007 all the way until 2015. Out of all the studio equipment I’ve ever had, the padKONTROL got by far the most use. The only reason I sold it was because the knob that you see pictured (under the 5.01), broke on a flight to Greece somewhere in luggage claim. Being that it’s such a rock solid piece of equipment, I can only surmise that reckless handling of my bag had something to do with it. I traveled with it quite a bit and it’s always been very reliable. Even after it broke, I continued to use it because it still worked! I was still able to make songs, although it was much harder because the knob that broke is what enables you to switch between keys and sounds. Drag a sample from your folder onto one of the pads. If you have sound packs, they will be under your browser on the left hand side in FL Studio. If you’re dragging samples, refer to this guide on how to sample in FL Studio. The basic concept is the same whether you are using the MPD 18 or padKONTROL though. Press the same pad on your padKONTROL or MPD. Many will disagree, but the pads on this controller feel better, softer, and more sensitive than My MPD18’s do. I suppose this is personal preference, but I put more stock into softness and sensitivity than I do in size. The MPD18 is great, don’t get me wrong, and it’s pads are slightly bigger. But overall it has a more rocky, rougher feel than the padKONTROL. Some would say this contributes more to it’s durability. I can’t disagree there. It’s heavier and feels more solid, but the pads are rock hard. To remedy this, press the “full level” button. It does help a great deal with pressure sensitivity. I will take this to the grave with me. The padKONTROL looks amazing. It always has, and always will. There’s just something about it that I can’t quite put my finger on. When idle, the pads light up and go through a series of patterns, which looks really cool in the dark (for those late night sessions). The pads also light up every time you hit them, which is kind of a small detail but still nice. The MPD18 by contrast has a more professional, tidy, and discrete look to it. It looks very slick in the studio. It doesn’t draw much attention to itself, but remains attractive enough in a more subtle and simple way. Do not buy either of these for their features. You will be disappointed. I had a very specific goal in mind when shopping for drum pads. Convenience. That said, The padKONTROL has a great feature that I thought I would mention. The X-Y pad. Amazing. Some don’t think too highly of it, but when I was first starting out and experimenting, I wore this thing out. It’s great for just that: Fooling around and what not. A basic understanding of how MIDI works. What is MIDI? Both work well with Reason and FL Studio. I really never used the MPD 18 with Reason, so I can’t comment on that; however a quick google search reveals that it’s a good pairing as well. Look. The MPD 18 is kind of ugly in my opinion. The pads on the padKONTROL light up. Not a huge deal, but cool nonetheless. Feel. The MPD 18’s pads are rock hard. It’s not as fun to play with. Features. The padKONTROL has a lot more. In 2007, the price tag of the KORG padKONTROL was up there. It has come down a little since then, but there is still such a demand for it that the price really hasn’t changed all that much. It’s such a great piece of equipment. For me, it’s the cream of the crop as far as simple and easy to use starter pads. It really is worth every penny and more, and will last you for a long time so long as you take care of it. Well that’s about it for today my friend! I hope you enjoyed this article on cheap midi keyboard drum pads! If you have any questions or comments, please leave them below or Contact me!! I look forward to hearing from you.. Which of these cheap midi keyboard drum pads do you feel is the best value?? Let me know!! Yeah for sure man. Thanks for stopping by! Sounds like a great little machine. It is really fun to use! Thanks for the helpful review! I will be sharing this post with some friends that could really use this info. Great work! Thank you Elasa! I really appreciate that. I could really use some traffic lol. For sure man. Especially when you’ve been accustomed to something for so long. I bought a new one (MPD) because the knob on the padKONTROL actually broke on a flight back from Europe. But it was customs fault, not the machine itself. It still works and I can still use it, but the inconvenience of the knob is troubling. I am going to buy a new padKONTROL soon, it’s just that good. great job outlining the special details and capabilities of the KORG Padkontrol. users looking for the this equipment will really benefit from the info and content on this site. Great information! Love the layout and the breakdown on this page. My brother in law has been looking. I’ll direct him to your site! Thanks Russell, I really appreciate that! At this price seems like a no-brainer. Great review Stu!